For years the classic holiday Yule-log fireplace video was enough to satiate those who longed for a cozy wintertime fire yet were willing to settle for a TV one instead. But now brands are beginning to realize that they too can capitalize on fireplace-themed tie-ins. Last year Outlander released a surprisingly soothing fireplace video featuring the show’s music. And now Marvel and Coco-Cola have teamed up to offer some Avengers-themed yuletide comfort as well. The Marvel YouTube page currently offers 10 different hour-long videos themed around its characters. 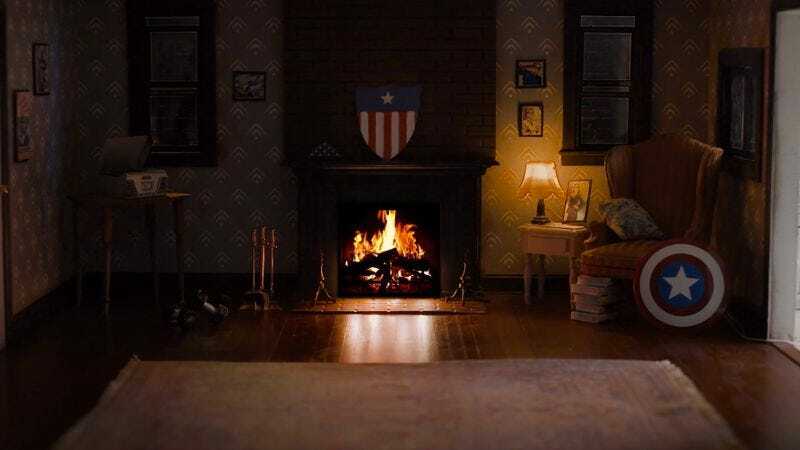 Which means you can enjoy your fake fire in Captain America’s Brooklyn apartment, Ms. Marvel’s New Jersey home, Thor’s Asgardian one, Iron Man’s Manhattan apartment, or the Guardians Of The Galaxy spaceship, where the fire is more of a glowing orb. Each of these videos also has a “close-up” version that puts more focus on the fire than the surrounding locale. As io9 points out, the whole thing feels like an incredibly random publicity stunt for both companies. The videos offer varying fire sounds and ambient music. Thor’s accompanying soundscape is vaguely haunting, while you can hear city noise at Ms. Marvel’s place. Captain America’s video actually comes with a jazzy holiday score, thus making it the most overtly festive of the five options. However, the Guardians video occasionally features a dancing Baby Groot (check around the 31 second mark), thus making it objectively the best one.